After the Highland, Michigan hail storm of 2014, storm chasers were knocking on doors throughout Highland, offering roofing deals that sounded great. If you’re not planning to fix your roof and it gets damaged in a storm, the expense can feel like a blow. Scammers know you’re hoping for the best possible news: you can pay a small amount of money and the job can get done very quickly. Unfortunately, you are going to end up losing more money if you believe these scammers. There are other ways you can lose money to a roofing scammer. Most homeowners don’t have that much experience with roofing contractors, so they don’t know. Storm chasers are commonly out-of-town roofing “outfits” that look for areas in the country that just experienced severe weather. For example, the high-wind damage that left much of Michigan without power for several days earlier in March 2017. These outfits know insurance companies are likely covering roofing damage in those areas, so they go there. They often offer free inspections, pass out leaflets, and ultimately give you a replacement that only lasts a few years. Sometimes the scammers will even damage your roof more to make sure insurance companies will pay. You can protect yourself by asking a few questions about their insurance and licensing. If they can’t produce written proof of both of those things, kick them to the curb. You’re not going to get good work out of them (they have no incentive to do good work) OR your money back in the end because they’ll be long gone. Again, these guys prey on inexperienced homeowners. Most people don’t want to pay more than they have to for a new roof, so they underbid the other companies knowing they’ll raise the price mid-project. The company will blame rising material costs and expect you to pay. And since you’re mid-project you will, just to get the work complete. The truth is manufacturers notify contractors weeks in advance when material prices are going to change. It’s also true that this is not the responsibility of the customer. Rising prices mid-project is a major red-flag. Make sure you get a quote in writing. Better yet, if one company is significantly lower than all the others, avoid it. This is another scam that can happen to anyone. One red flag a lot of homeowners don’t know about is asking for a down payment before work begins in order to buy materials and hire personnel. This check, often in the form of the homeowner’s insurance payment, can disappear quickly along with the roofing company. These scammers particularly target areas with many retirees who probably own their homes and have insurance checks made out to them. However, scammers also target homeowners paying mortgages. 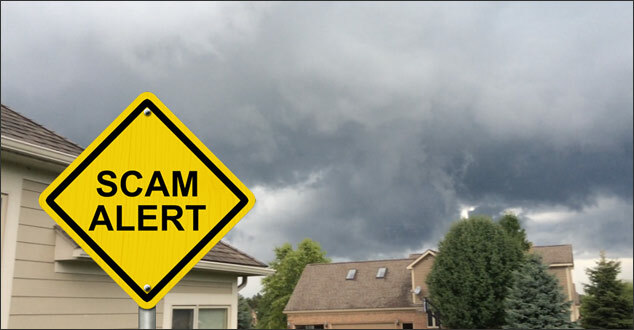 The main way to protect yourself against this scam is to never make a down payment to a company before the supplies for your roof have been delivered. Don’t do business with anyone who wants you to sign over your check before any work is started or supplies are delivered. These aren’t the only scams out there, but they are some of the most common. The best thing you can do to avoid scams is to do your research and hire a reputable local company that can provide references. And of course, if you are in Southeast Michigan, Renovations Roofing & Remodeling, Inc. would be delighted to take care of all your roofing needs. ‹ Skylights Pros and Cons: Are They Worth the Money?